...Add Live Circus Entertainment Customized to Fit Your Event! Add glamour and excitement to your event with jaw-dropping acrobatic performances on aerial fabric, rope. sling, or hoop. ﻿Turn up the heat by featuring sizzling performances at your event using nature's most dangerous element. Get the party started with mesmerizing light shows featuring glowing LED props, costuming and special effects. 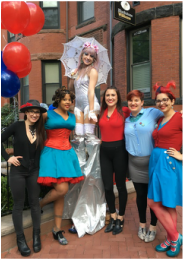 Larger than life stilt characters mingle with guests, pose for photos and provide pop-up performances while roving around your event. "What a great addition to our party! Siena provided both fire dancing and LED hoop performing. She performed for an extended period of time for a very fair price and the guests really liked it. Watching the LED hoops spin at night was mesmerizing. I would highly recommend her for your event!" 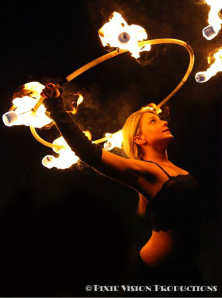 "I hired Siena for stilt-walking and fire spinning for my outdoor wedding celebration. She is extremely thorough, intelligent, and professional. ALL of this is so necessary when planning events, and many creatives and artists fall short in this category (rightfully so). She responds very quickly and she genuinely cares about clients and her craft. She even went out of her way to change her entire performance to incorporate the two performances, after my fire breathers cancelled. She saved the day! The fire spinning was so fun, the costumes were creative, and the fire show entertained adults and kids alike. It was exactly the right touch to remind all guests not to take themselves too seriously :)"
"Siena Moon is so darling. So easy to work with, open minded and up for anything! She came to my store on Newbury Street to help liven up a party we throw every year and she became part of our family in minutes! She comes prepared, she even got on her stilts while the wind was unruly. She was great, I will be using her again next year!"